TOKYO, Japan (CNN) -- Sentiment among Japan's largest manufacturers is at a record low, according to a key business survey released Wednesday morning. 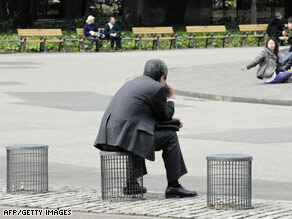 A businessman sits on an improvised chair at a Tokyo park on Tuesday. The Bank of Japan's quarterly Tankan survey showed sentiment among large manufacturers plunged to minus 58 in March from minus 24 in December. The previous record low for the survey was minus 57, reached during the oil shock era of the mid-1970s. The negative sentiment cut across all large, medium and small enterprises, from manufacturers to non-manufacturers, was negative. The Tankan survey is a forward-looking and extensive indicator of the state of Japan's economy. It gauges how global exporters in Japan -- like Toyota and Honda -- feel about the business conditions in which they operate. The survey is one of the few forward-looking indicators that give investors a window into the immediate future of the world's second largest economy, and it helps the Bank of Japan set monetary policy. Kirby Daley, senior strategist at Newedge Group, hoped the survey might show a glimmer of hope towards Japan's recovery, but braced for the worst Wednesday morning. "The results of this Tankan actually reflect reality," says Daley. "The reality is that Japan's economy is in a very, very bad state and there is no quick and easy fix. The results of this survey really point to the dire situation that Japan's economy is in."